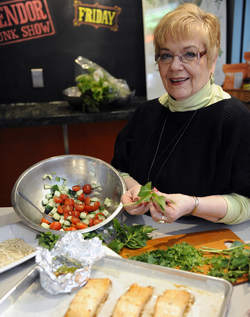 “Cooking can – and should be – fun!” Over the past 35 years, Judith Hines has shared that philosophy with students in her cooking classes, at promotional events, and through her personal appearances. As Director of Culinary Arts and Events for the City of Chicago’s Department of Cultural Affairs, Judith’s work for many years included developing the groundbreaking field of culinary tourism for the city; launching Chicago’s Downtown Farmstand to highlight and offer fresh food from small farms and producers in the Chicago area; serving on the City Colleges Culinary and Hospitality Showcase steering committee and City College Culinary Program Advisory Board; managing and teaching classes at World Kitchen, a municipally funded cooking school open to the public; lending her expertise as a steering committee member for a possible Chicago Culinary Museum; and producing other large-scale events hosted by the Mayor and other City departments. In addition to her work with the City, Judith has served as training and promotions coordinator and cookware specialist for several cookware lines, including Calphalon, Cuisinart, and Chantal, as well as in-house chef instructor for Gaggenau, Viking, and Bosch kitchen equipment. During her tenure as Director of Culinary Events for Carson Pirie Scott’s Midwest stores, Judith was named a ‘Top Teacher of the Year in Chicago,’ and recognized in Who’s Who in Chicago Food and Wine, and Who’s Who of American Women. She has previously owned her own cookware shop, and was co-owner of DemoPros, which provided sales and marketing assistance to manufacturers of food products, housewares, and retail departments. Throughout her extensive career, Judith has had the opportunity to work on a wide variety of projects, ranging from culinary technical direction for a cable television series to serving as kitchen coordinator for the nationally syndicated Chinese cuisine cooking show, Yan Can Cook, on PBS. She was invited to the San Francisco Bay area to work with Martin Yan, serve as owner/director of his cooking school, and be a kitchen producer of his award-winning show for four seasons. She also worked there as a culinary producer for celebrated chef Jacques Pepin. While working with Yan Can Cook, her responsibilities were in handling writing and photography for cookbooks accompanying his show, and scheduling and preparations for his author appearances. While in California, Judith was Chef at Woodside Women’s Hospital, where she planned and prepared menus and meals for patients suffering from eating disorders and depression, enticing them to rediscover the joy of food through entirely fresh ingredients and attractively presented plates. Judith’s professional affiliations include serving on the Board of Directors for the International Association of Cooking Professionals, the Women’s Foodservice Network, and Les Dames d’Escoffier, and serving on the Advisory Board for Washburne Culinary Institute and Kendall College, where, in the late 1990s, Judith was Special Events director. In 1997 and 2007, Judith oversaw all planning, programming and coordination for the International Association of Culinary Professionals’ annual convention, which brought nearly 2,000 food professionals from 30 countries to Chicago. She was part of the team hosting the International POW WOW Travel International in Chicago, which involved 7,000 guests from 69 countries. She also played a pivotal role in managing food and hospitality for 400 international guests during Mayor Richard M. Daley’s Millennium 2000 Celebration in Chicago. Judith chaired the International Conference for Les Dames d’Escoffier in 2005, won the Chicago Tribune’s Good Eating Award in 2006, and was profiled by the Chicago Tribune as Chicago’s Culinary Ambassador in 2009. Currently, Judith writes a bi-weekly column, “Low Mileage Kitchen,” which appears regularly in the Chicago Sun Times food section.